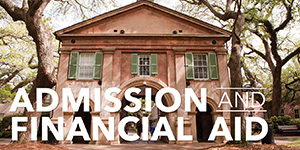 This is the College of Charleston's official commencement information site. Please check back regularly for updates made throughout the year. Information about how to apply to graduate and about both our Spring 2019 and Winter 2019 commencement ceremonies are listed below. We are excited to have you join us at one of our commencement ceremonies and hope you have a wonderful time! 2:30 pm: Gates to Cistern Yard and doors to all satellite viewing areas open to guests. 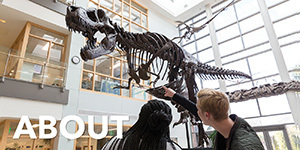 2:30 pm: Master's degree candidates should assemble on the third floor of Robert Scott Small, and all Bachelor's degree candidates should assemble in Maybank Hall. 8:30 am: Gates to Cistern Yard and doors to all satellite viewing areas open. 9:00 am: All Bachelor's degree candidates should assemble in Maybank Hall. 2:30 pm: Gates to Cistern Yard and doors to all satellite viewing areas open. 3:00 pm: All Bachelor's degree candidates should assemble in Maybank Hall. 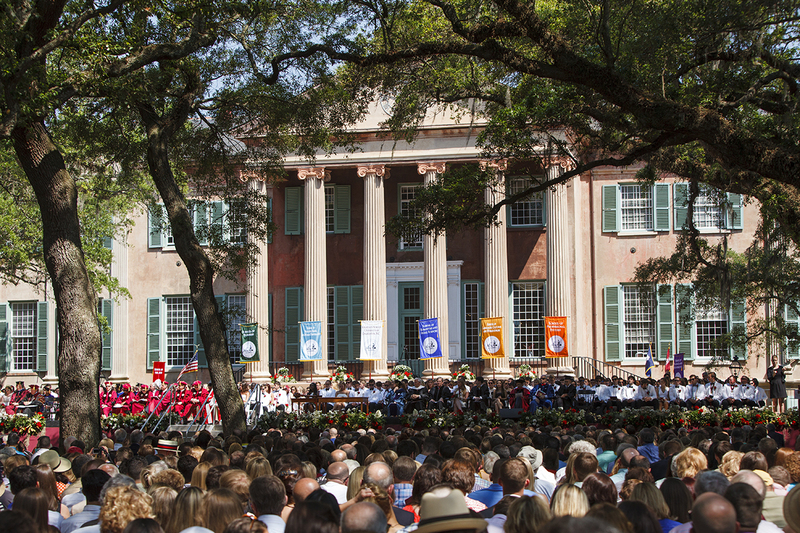 Each Spring Commencement ceremony is scheduled to be held in the Cistern Yard, located at 66 George St., but a ticket is required for admittance. 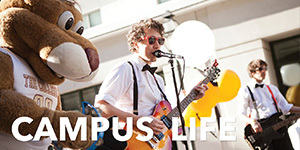 One commencement ticket per adult/child/baby is required for entry. The Stern Student Center Ballroom on the fourth floor of the Stern Student Center at 71 George St.
Child-friendly rooms on the second floor of the Stern Student Center at 71 George St. The Recital Hall of the Simons Center for the Arts at 54 St. Philip St. The Emmett Robinson Theatre at the Simons Center for the Arts at 54 St. Philip St.
Rita Hollings Science Center (Rooms 101, 102, 103) at 58 Coming Street. 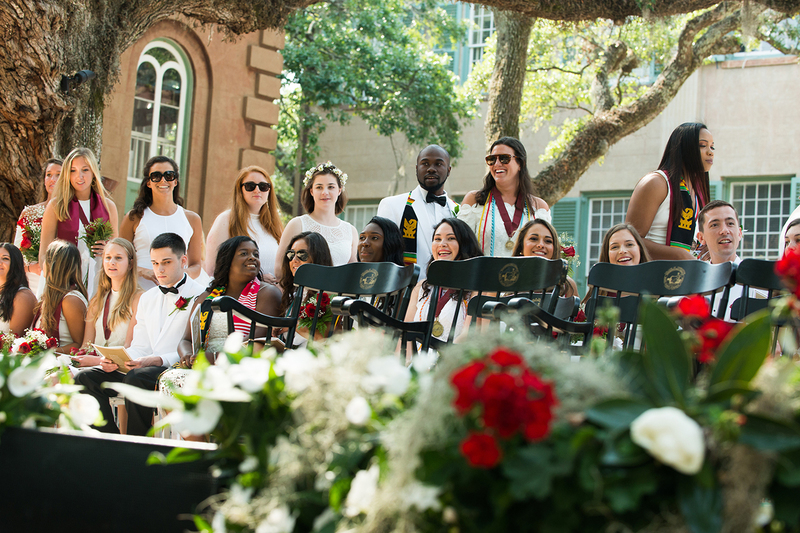 For guests who can’t make it to campus, live video from each ceremony will be broadcast on the College’s Facebook page and at cofc.edu. If the event of inclement weather, an announcement will be displayed on the College's homepage (www.cofc.edu) as well as on local TV and radio stations as outline on our inclement weather plan. Students receive FOUR tickets for Spring Commencement. Tickets are required for all family and guests viewing the ceremony in the Cistern Yard. 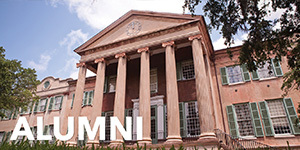 One commencement ticket per adult/child/baby is required for entry into the Cistern Yard. Tickets are not required for guest to enter designated satellite viewing locations. Tickets will be distributed electronically to graduation candidates in April. Please see Ticket Information. There is no charge for commencement ceremony tickets. Producer Sonya Houston ’86, filmmaker Jody Gottlieb ’89, and doctor Ebony Hilton-Buchholz ’04 will be the featured speakers during the 2019 College of Charleston Spring Commencement ceremonies. Read more about the 2019 commencement speakers and honorary degree recipients. 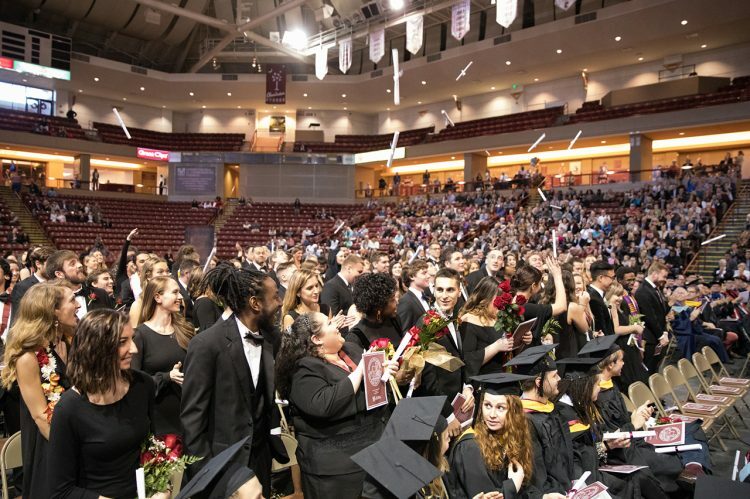 *NEW* In order to expedite entry and provide a safe and secure environment for our students, faculty, guests, and other visitors, the College of Charleston has implemented a Clear Bag Protocol for its ticketed events, including Commencement. Only clear bags and small clutch size purses are allowed in the Cistern Yard. Bags will be checked by security upon entry to the Cistern Yard (or TD Arena rain location). Please read our Prohibited Items List (which includes, but is not limited to, unapproved bags, alcohol, smoking, vaping, and weapons). Please note that the College of Charleston is a Tobacco-Free campus. For graduating students, there will be a bag check conducted by security before the ceremony in the student assembly area. Only clear bags and small clutch size purses are allowed. You are advised to bring as few personal belongings as necessary. No bags will be allowed on stage. No outside food or beverages will be allowed in the assembly area. Please do not bring opened outside beverages because water will be provided on stage to graduates. The following items are prohibited: alcohol, smoking, vaping, weapons, and open, outside beverages. Please view the Alcohol Policy. Staff will monitor entrances and exits with support from Public Safety and our security team. NOTE: All information below subject to update. 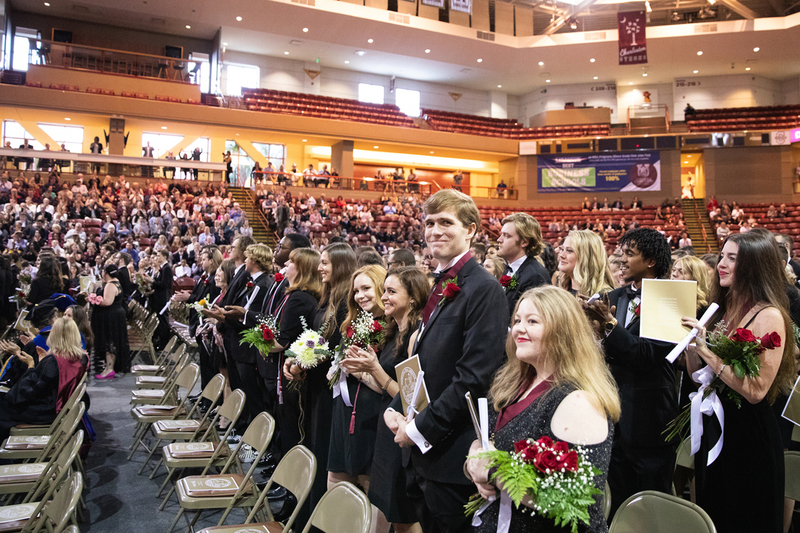 All academic schools with candidates participate in one ceremony for the winter commencement exercises. 12:30 pm: Doors open to guests. 12:30 pm: Master's degree candidates should assemble in Media Room, and all Bachelor's degree candidates should assemble in practice gym. The Winter commencement ceremony will be held in the TD Arena, located at 301 Meeting St., and a ticket is required for admittance. One commencement ticket per adult/child/baby is required for entry. For guests who can’t make it to campus, live video from each ceremony will be broadcast on the College’s Facebook page and at cofc.edu. The Winter Commencement ceremony is indoors, so the location will not change in the event of rain. 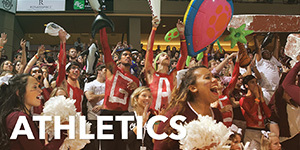 If the event of inclement weather, an announcement will be displayed on the College's homepage (www.cofc.edu) as well as on local TV and radio stations as outline on our inclement weather plan. Students typically receive TEN tickets for Winter Commencement. Tickets are required for all family and guests viewing the ceremony in the TD Arena. One commencement ticket per guest is required for entry. Tickets will be distributed electronically to graduation candidates during the Fall 2018 semester. Please see Ticket Information for future distribution details. There is no charge for commencement ceremony tickets. In order to expedite entry and provide a safe and secure environment for our students, faculty, guests, and other visitors, the College of Charleston has implemented a Clear Bag Protocol for its ticketed events, including Commencement. Only clear bags and small clutch size purses are allowed in the TD Arena. Bags will be checked by security upon entry. Please read our Prohibited Items List (which includes, but is not limited to, unapproved bags, alcohol, smoking, vaping, and weapons). Please note that the College of Charleston is a Tobacco-Free campus. Speakers are TBA. For more information, please visit the Commencement Speaker(s) and Honorary Degree Recipients. Graduates and guests should park at one of the public garages near the TD Arena. The closest garages are the Gaillard Garage, located at 32 Alexander Street, and the George Garage, located at 34 St. Philip Street. The rate for each of these locations is $1 per each half hour or portion thereof, with a daily maximum of $16 per calendar day. The College of Charleston surface parking lots will be available only to faculty, staff, and students working the ceremony. » UNDERGRADUATE STUDENTS: Go to the graduation application. 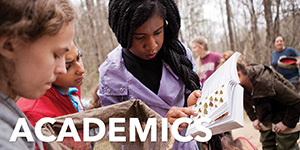 » GRADUATE SCHOOL CANDIDATES: Go to the Graduate School graduation application.